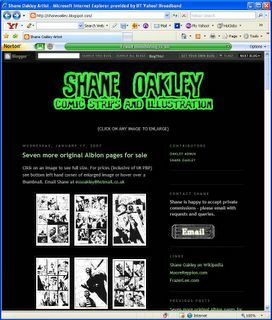 Click on the screen shot (above) to visit Shane Oakley's Blog and buy Albion artwork. Shane Oakley is now selling original artwork from the series plus some of his concept sketches over on his Blog at www.ShaneOakley.blogspot.com. Albion fans should definitely get over there and bag some pages before it's too late. Click on the screen shot (above) to read our Publisher's Weekly interview. In other Albion related news: Leah and I have been interviewed about the TPB edition over on the Publisher's Weekly site (how professional does that make us feel? Very).